Many may get turned off by the location of Terra American Bistro, but the neighborhood locals know it’s a gem in disguise. It’s definitely a little obscure and not in a prominent area known for exceptionally great food, however, once you pass through the threshold, you are pleasantly surprised. If you enjoy phenomenal, fresh, and unique menu items, then this little East County gem is a must see, or a must taste rather. 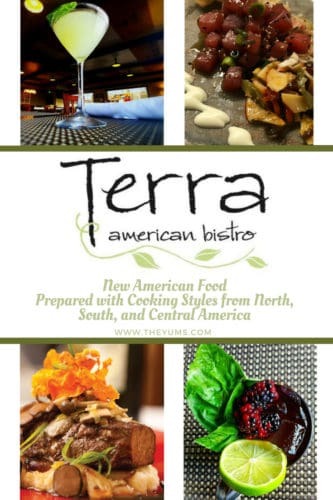 Menu: Terra American’s cuisine can be described as New American food and is prepared with ingredients and cooking styles from North, South, and Central America. Chef/Owner Jeff Rossman designs every item with a focus on sustainable, local, organic agriculture from local farms here in San Diego and Riverside counties. The menu contains a plethora of options for all ages of taste buds. On the appetizer menu, you’ll find a delicious variety of choices like Hand Cut Truffle Fries, Garlic Shrimp, Lamb Meatballs, and Potato, Brie & Red Onion Quesadillas. The entrees range from more known items such as House Made Pastrami Sandwich, Terra Burger, and Roasted Local Fish to more unique items such as Cioppino (seafood stew), White Marble Farms Center Cut Pork Chop, and Adobo Roasted Half Mary’s Chicken. There are also salad, pasta, and additional side options available. Don’t forget to top off your tasty of tastiest meals with a remarkable dessert. Complete your meal with St. Louis Gooey Butter Cake, Cast Iron Baked Banana Bread Pudding (a favorite among reviewers), Flourless Chocolate Cake, or a House Made Seasonal Sorbet or Ice Cream. If solid desserts are not your preference, choose a liquid dessert – Espresso Martini or Terra 43 (containing house-made coffee liqueur) will be a palate pleaser, I’m sure. Thoughts: The neutral color palette, garden wall, brick, exposed wooden beams, and polished concrete floors provide for a uniquely elegant, yet simple dining environment. I was amazed at how great the acoustics were for an engaging conversation. Although most tables were occupied, conversation was not a problem. We elected to have the Hand Cut Truffle Fries and Fried Brussels Sprouts as an appetizer. The truffle fries were nice and crispy and were paired with a homemade house ketchup that is sweet and oh so fresh. The Fried Brussels Sprouts made my mouth water with the tangy lemon and parmesan additions – a fantastic, flavorful treat for the taste buds. We chose the Mt Cook King Salmon and the Karl Strauss Amber Lager Braised Pot Roast for our entrees. The salmon was absolutely superb – exceptionally fresh and the spring salsa verde sauce was a unique, tasty addition. The pot roast was extremely tender and cooked to perfection – melt in your mouth perfection. The sagu (Bolognese) sauce on the pot roast was definitely a favorite. While Terra American Bistro is a farm-to-table restaurant, an added surprise was that it does not save its sustainable, local, organic ingredients only for its food – it’s extended to the bar as well. Seasonal fruit and herb-infused vodkas made in-house are a strong feature, along with a wide variety of local craft beers and a wine list that seems to be endless – more than 80 bottles of mostly California wines. With such a wide array of drink choices, Terra American Bistro is a magnificent spot to catch a happy hour or “Social Time” as Terra American calls it. One thing I really like about Terra American is they’ve created some fun options for your dining experience. Their Price Fix Menu is a per person charge with a select number of appetizers, entrees, and desserts to choose from. Their Chef’s Tasting Dinner Menu is also a per person charge for Chef’s chosen menu options. The Chef’s Tasting Dinner may be enjoyed with wine/cocktail pairings for an additional charge. There is also Early Dining, Sunday Brunch, and Date Night Thursday. Lastly, you can join Chef Jeff for a communal Chef’s Farm to Table Dinner. Price: Appetizer items range from $9 to $15. Salads range from $10 to $17. Entrees range from $16 to $25. Solid desserts range from $4 to $7 and liquid desserts are about $9. The kids’ menu is a set price of $7.95 and includes one entrée, one side, and a beverage from a selection listed. Sunday Brunch prices range from $9 to $15. The specialty menu options (The Price Fix Menu, Chef’s Tasting Dinner, Early Dining, etc.) range from $30 per person to $70 per person. Author Bio: Janine Holman is a freelance writer, photographer, and travel blogger. Janine strongly believes all people should be unforgettable – everyone has a story and those stories should be told. She helps people become immortal by leaving their stories – their legacies – for future generations to know who they were, what they accomplished, and what life advice they would give them. Janine preserves stories, inspires future loved ones, and creates a connection between generations that otherwise would not be available. When she is not telling other people’s stories, Janine works at creating her own. Janine loves to travel and through her inspirational and motivational lifestyle platforms, Awaken Your Limitlessness and Life Beyond Awesome, she encourages others to design and live a fulfilling, limitless, and abundant life and create a legacy of your own. She is passionate about sharing these platforms through speaking engagements at schools, events, conferences, seminars, workshops, meetings.